2019 Farmer Applications available for download on our Vendors page. 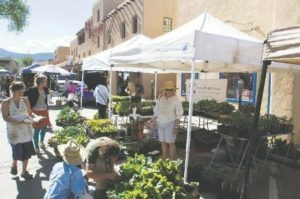 Know the food, you’ll know the place – whether you’re a tourist or a bonafide Taoseño we welcome you to one of New Mexico’s most diverse and visited farmers markets. In supporting our farmers we support stewardship of our beautiful Northern New Mexico lands. 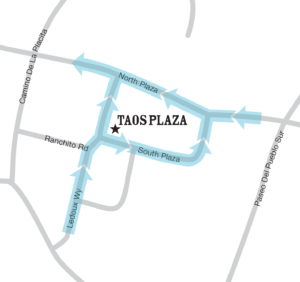 We are located in Taos’ Historic Plaza, a must-see on your visit to our lovely mountain town. Why not visit this historic place when all the locals do! 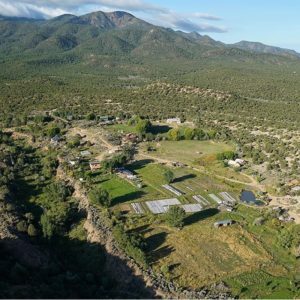 Everyone in Taos knows where to get the freshest food in the region, directly from the hands of our beloved farmers. We exchange EBT/SNAP transactions for Tokens at the Info Booth. We also offer the option of Double Up Food Bucks to our EBT customers, we match your EBT transaction amount with the equal amount for FREE to be used on fresh fruits & vegetables! Many of our farmers also accept WIC & Seniors’ $5 Farmers Market Checks, look for the bright green sign at farmer’s booths. New 2019: we will also be redeeming vouchers from El Centro Family Health food voucher recipients! We are looking forward to another incredible season of fresh, local, delicious food grown and prepared by our community! Join us on the Plaza every Saturday May 11- October 26, 2019 8:00am-12:30pm Follow us on Facebook and Instagram for weekly updates!